So many artistic decisions go into planning weddings, actually including art can be a way to personalize celebrations. The venue itself can be artful. Chris and Sheila Morse, who own three art galleries on the Island, celebrated their marriage in one of them, the Granary Gallery in West Tisbury, on New Year’s Eve 1996. Though it’s more common for the gallery to host a rehearsal dinner, which was the case for Kate Rochow and Chris Homlish who married at the Harbor View Hotel in Edgartown last June. One of the Morses’ other galleries, The Field Gallery in West Tisbury, has a large field for open-air or tented celebrations, and Tom Maley’s iconic, white, garden sculptures have made it a popular place for a photo op. The white figures have played many a role in Vineyard marriages: Before it was sold, men were known to propose in front of He Loves Me, a whimsical sculpture that continues to typify the collection, and for a September wedding a few years ago, the bride and groom used an image of the sculpture in their printed materials. A guest book for your coffee table. 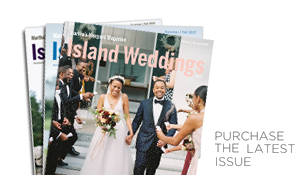 Vineyard wedding planner Lynn Buckmaster-Irwin likes to include art in the weddings she plans, and she suggests using a book of Island art as a guest book. Friends and family can find a picture they like and write something on the blank page opposite. Consider Robert Bowden’s book of lovely Vineyard watercolors, On Martha’s Vineyard (Universe Publishing, 2003) or Where Magic Wears a Red Hat: The Art of Stanley Murphy (Martha’s Vineyard Museum, 2004), a larger book for a larger crowd. An embossed or silk-screened graphic can carry a common theme throughout the save-the-date announcement, invitation, welcome packet, ceremony program, dinner menu, seating chart, table settings, even thank-you notes. Dana Gaines, a graphic artist in Edgartown, who uses pen line, watercolor, and airbrush can design a motif, such as a lighthouse, a beach wave, or a seashell, or he can get creative with your idea. Wedding planner Lynn Buckmaster-Irwin arranged for Dana to design a watercolor map for one couple with festivities in Edgartown – wedding guests could easily locate the church, reception, overnight accommodations, and more. Photos of the Island can also be used. A save-the-date announcement printed on Oak Bluffs photographer Alison Shaw’s stunning images can open your guests’ eyes to the beauty that awaits them. Welcoming your guests with a pack of her colorful photos of Vineyard scenes and venues such as the West Tisbury Farmer’s Market could entice anyone to venture out and enjoy what the Island has to offer. And one of her breathtaking sunsets sitting on a turned-down bed would make a perfect end to a full day of wedding party revelry. West Tisbury artist Steve Lohman creates sculptures of brides and grooms that are made out of a single wire, nicely connoting the union of husband and wife. Steve was commissioned by a mother of the bride to make this wire sculpture for the top of one couple’s cake. If you know of an artist whose work may translate to the top of a cake, ask if you can commission a piece – and bonus: It could stay with you throughout your marriage. The crème-de-la-crème of weaving art into your wedding is consigning a live-event painting. For a price similar to that of a photographer or videographer, Gail Fitzpatrick, a Boston-area artist, will set up under your tent and paint a picture of your reception while it’s happening. She arrives early, as soon as the tables are under the tent, to determine the right color hues, and fill in the background – table settings, flowers, lights. While neatly tucked into a corner with her easel, she fills the painting with people during the reception. Curious about what she’s doing, wedding guests mosey over to watch the impressionistic process unfold. And when they see Aunt Anna’s pink dress start to sway on the canvas and cousin Lou’s wild hip-hop moves come alive, the artist’s capturing of the day becomes a thrill for all. “It’s kind of a high-wire act,” says Gail, “but there’s something magical about a painter executing a painting on the spot. It feels historical.” She loves when the bride and groom finally make it over to her easel, usually late in the event. She says, “It’s like a surprise from behind the scenes.” And a live-event painting is often one of the only elements of the party the bride and groom haven’t orchestrated themselves. Later, a thank-you card with a reproduction of the painting warmly reminds everyone of the celebration. And the painting itself becomes a treasured piece of art for the bride and groom’s home – where it just might remain for many generations.